The alternative Easter egg – how to decorate them naturally with vegetables! Easter does not have to be all about the chocolate; vegetables have plenty of fun to offer too! 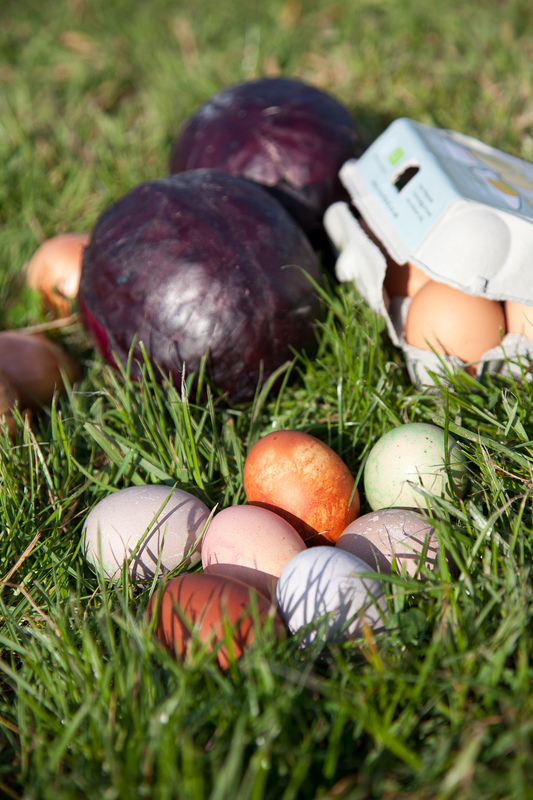 A great way to get all the family involved, roll up your sleeves and work together to use any leftover veg to make pretty, naturally dyed Easter eggs. You can colour ordinary hen’s eggs with vegetable dyes at home in your kitchen, as different veg produces different colours. They create more subtle tones than chemical colourants, but as they are harmless dyes, it means that you have the added fun of eating colourful boiled eggs afterwards on a picnic lunch. Especially popular with kids! 1-2 teaspoons of white vinegar – this helps fix the dye to the egg shell. Your chosen veg – see below for the colours each creates. Eggs – try to use ones with the palest shells you can find, as they will show the colour more. There are many more colours you can create from natural materials; look online for more ideas. Just make sure that whatever you use is safe to eat first if you are planning to eat them, as egg shells are porous and will absorb the colourant. Gently wash your eggs, then place in a single layer in a saucepan with enough water to cover. Add a teaspoon or so of white vinegar along with your natural dye; the more dye material you use, the more intense the colour. Some veg will need boiling first (see dye list), in which case you add the eggs and the vinegar at the end of the boiling time. Simmer for 15-20 minutes. Remove the eggs and put to one side to cool and dry; an egg box works well as a drying rack. If you want a darker colour, remove the eggs from the liquid, strain the dye through a coffee filter and cover the eggs with the natural dye once more. You can leave them overnight if you like, but either way make sure they go into the fridge if you are planning on eating them (and consume within 24 hours of boiling). Repeat the same process for any additional colours you want. You can give the eggs more of a glossy finish by rubbing them with vegetable oil, and using wax or crayons to draw shapes or patterns before dyeing them can make your eggs even prettier. You can also layer dyes to create different colours – much of the fun is in experimenting and seeing how the eggs turn out. Note (optional): Bear in mind that what you use to dye the shell can sometimes flavour the egg itself a little, so you may prefer to ‘blow’ the eggs first to empty the raw egg out. This also means that you can keep your coloured eggs. To do this: First wash the egg gently but thoroughly in warm water. Next, slowly make a small hole with a clean sewing needle at the pointed end of the shell, taking care not to crack the egg. Make a second hole at the opposite end, about double the size of the first. Use a knitting needle or similar to pierce the yolk of the egg via the larger hole, then, gently holding the egg between forefinger and thumb over a small bowl, blow through the smaller hole to get all the raw egg out and put aside for an omelette of spot of baking. Rinse the emptied shell thoroughly in cold water and use as above.